Most anglers know we had been going through a bit of a dry spell for several weeks, but, oh boy, did that come to an end. The heavy rains and stormy conditions moving through the state the past few days are expected to last through the weekend. But the sun will shine again and it will be time to share the outdoors with family and friends. Fishing offers family time – catching up or reminiscing about growing up together – like no other activity. There are some free fishing days coming up June 2, 9 and July 4. If you can think of someone you might like to introduce to fishing, this is a great opportunity for someone to try the sport without buying a license. New emergency regulations for hooks, bait and striped bass are in place from May 16 through Oct. 12. Along with the new minimum size of 19 inches, fishermen must use non-offset circle hooks when chumming or live-lining for striped bass to reduce hooking mortality of released fish. The department is proposing to extend these regulations through the entire 2018 and 2019 summer and fall seasons, and is currently accepting comments from the public. We have developed informational links online to help you know what types of circle hooks are legal and also answer some frequently asked questions about using circle hooks. We also urge you to take a look at our online map to understand the regions you can fish and when. Once you upload the map you can enter the date you are interested to fish, and the map will change to show you what areas are open. The transition to circle hooks for those who are not familiar with them might be difficult – from the reaction of “setting the hook” when a fish bites, to letting them run off until the line tightens and the hook engages. If you have guests on your boat that don’t understand the concept of allowing a fish to hook themselves, please take the time to guide them. As a fishing community we are all in this together, and we share a striped bass fishery that we all have worked so hard to bring back to a healthy and viable fishery. With the recent warm weather came a normally occurring algal bloom known a “mahogany tide” along the western shore from about Sandy Point south down near Chesapeake Beach, and also in the Severn and South rivers. Although this regular natural phenomena causes poor water clarity due to brownish-red water, and can cause lower-than-normal oxygen conditions at depths below 20 feet, it is not a threat to human health. The cool, wet, cloudy weather may temporarily break up the bloom. Main bay water temperatures are close to 70 degrees as reported from the National Oceanic and Atmospheric Administration buoys at Annapolis, Gooses Reef and Point Lookout; expect the cool, cloudy, and wet weather to maintain those temperatures. Expect below-average water clarity and above-average flows moving down the Potomac River and along many streams entering the bay as a result of heavy rains. There will be above average tidal currents through Sunday as a result of the new moon May 15. As of Wednesday, the northern boundary line in the upper bay has moved to a line drawn from the southern tip of Hart-Miller Island across to the terminus of Route 21 in Tolchester. This opens up a little more fishing territory, in particular the lower end of the Tolchester Channel. The steep channel edges off Love Point, Podickory Point and the Triple Buoys have been popular for trolling and with good reason. Post-spawn striped bass are slowly moving down the bay from the Susquehanna-Elk river complex and are using these steeper channel edges on their trip south. Water conditions are a bit stained so chartreuse has been the most popular color for parachutes and bucktails dressed with large sassy shads. Some anglers say a dark head on the lure is an advantage in stained water. The Dumping Grounds or Rock Piles – as they are called on nautical charts – just north of the Bay Bridge are another location definitely worth checking out. 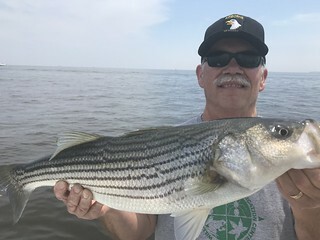 Striped bass under 35 inches are now fair game and the standard for keeping two fish remains that one striped bass can be over 28 inches and one must between 19 and 28 inches. Many anglers will now be placing medium-sized offerings in their trolling spreads for the smaller striped bass. The Susquehanna Flats area now allows anglers to keep one striped bass between 19 inches and 26 inches per day; the same boundaries that define the Susquehanna Flats catch-and-release fishery apply here. Those who love their light tackle fishing can now enjoy targeting striped bass by jigging over suspended fish. Channel edges and structure such as the Bay Bridge piers and rock piles offer a fun alternative to trolling. The early morning and evening hours will also provide some shallow water action for those who love to cast topwater lures and swimbaits. Chumming and chunking will be an additional option now, and the classic locations along steep channel edges will be popular places to give it a try – just remember that non-offset circle hooks are required. The Susquehanna River has been running a bit high lately as water is being released from recent storm events; the water is reported to be somewhat stained. There are a lot of white perch to be caught in the lower river and there is still some hickory shad action in the river, but the Deer Creek catch-and-release fishery has been a big disappointment so far this year. White perch are also moving into the lower areas of the region’s other tidal rivers and providing fun fishing. Trolling for large striped bass along popular channel edges has definitely improved over the past week. The post-spawn striped bass have been trickling out of the spawning rivers so there has not been a period where one might refer to as a blitz. Anglers have been putting in their time and although some would refer the fishing as a pick, there are a few things one can do to up the odds. 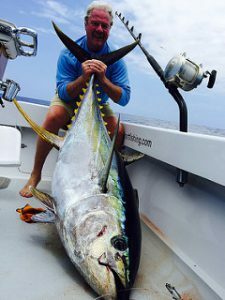 A good tactic is getting out early before the boat traffic drives fish down, along with getting lures away from your own engine noise and using planer boards or trailing flat lines far behind the boat. Large parachutes in chartreuse often work best in stained water and white in clear water; both should be dressed with large sassy shads. Umbrella rigs can be a good option for attracting the attention of a passing fish as are tandem rigged lures. The swift currents along the steep edges of the shipping channel are the superhighway for these large striped bass. Finally the trolling mantra has always been if things are slow, one should be checking lines and trying different lures or strategies. Surface water temperatures in the middle bay are about 67 degrees now which is a very comfortable temperature for all sizes of striped bass. The channel edges near the Brick House Bar to Bloody Point, south past Buoy 83, the False Channel and the Choptank River around R10 and R12 as well as the CP Buoy south are all excellent places to intercept large fish. Now that keeping striped bass smaller than 35 inches is an option, many will be pulling smaller trolling lures in their spreads for striped bass smaller than 28 inches. Those who love their light tackle fishing can jig over suspended fish along channel edges or structure. 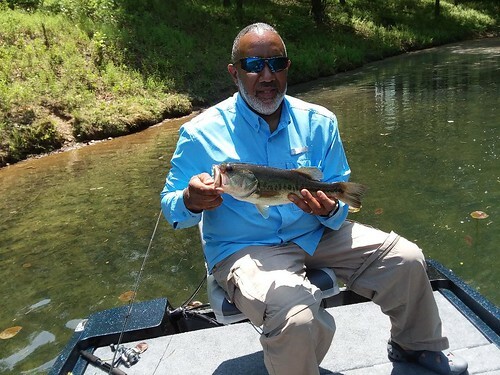 The shallow water fishery along prominent points and sunken breakwaters are beginning to come into full swing now for those who love throwing topwater lures. It is time to break out that 7 or 8-weight fly rod and enjoy casting skipping bugs on a floating line in the shallows. White perch have finished their migration down the tidal rivers from the spawning reaches and are now taking residence in typical summer environments in the lower sections of the tidal rivers. They are providing fun fishing from docks and piers as well as various shoreline and open water structure. Fishing with a bottom rig baited with grass shrimp or bloodworms near structure is a great way to catch them. Casting small jigs, spinnerbaits and spinners with ultralight tackle near shallow structure is also a productive and fun way to catch them. 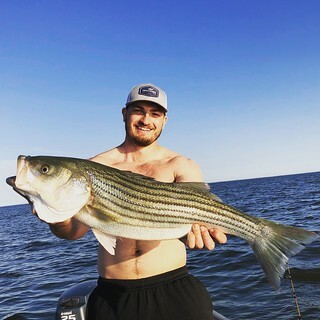 Trolling for striped bass has been relatively good in the lower bay region this week and should continue as more post-spawn striped bass pass through the region. The traditional shipping channel edges off Cove Point and Cedar Point down to Point No Point have been the best places to troll on the western edge of the channel. On the eastern side of the shipping channel, the area inside the CP Buoy down past Buoy 72 has been producing some nice fish. 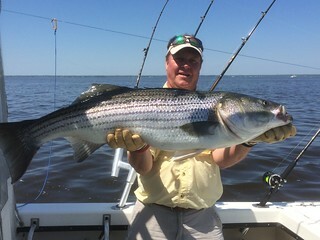 The Tangier Sound channel has also been a great place to catch fish leaving the Nanticoke River. The channel edges at St. George Island and Piney Point are two of the best places in the lower Potomac River to troll. Trolling spreads will contain a few smaller baits this week to target striped bass under 28 inches and light tackle jigging is a wonderful option when suspended fish can be found. The shallows around Cedar Point and the marsh edges on the eastern side of the bay will be providing plenty of fun shallow water action this week. Casting topwater lures and swimshads are a fun way to fish these areas. It should be soon, if not already that speckled trout begin to appear along the eastern marsh edges. White perch are setting up residence in their typical summer haunts and always provide plenty of light tackle action. There are rumors of the first croakers being caught in pound nets near Point Lookout recently. 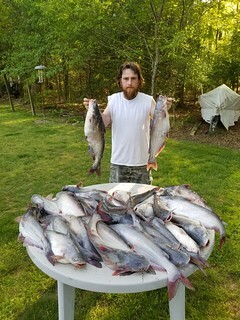 Fishing for blue catfish in the Patuxent and Potomac Rivers remains very good if not over the top this week. It does not take much in the way of sophisticated gear to catch them, just some stout tackle and fresh bait. Fishing for blue catfish has been good from the mouth of the Wicomico River at Bushwood all the way up to the Wilson Bridge. The general area from Smallwood State Park to the Wilson Bridge tends to be the most popular area to fish, with good boat ramps at Smallwood and Fort Washington. There still reports of good catch-and-release fishing for hickory shad in the Washington, D.C. area of the Potomac. This fishery is a fly casters dream; all it takes is a sinking line, some small shad darts or colorful flies. There is plenty of casting room and plenty of eager hickory shad and American shad to offer some fun catch-and-release action. It is getting to that time of the year when folks start thinking about blue crabs. The flowering locust trees tell us it is time for the first major shed, but I don’t think we’re going to see much of that until the second full moon this month, around Memorial Day. The results from the winter dredge survey indicate that the adult crabs spending their second winter in the bay’s bottom had a hard time with that extremely cold January weather. The good news is that the juvenile crab numbers are up so we’ll have to be patient as they grow this summer. It might take a while to catch enough crabs if you promise your local clan a crab feast for Memorial Day this year. 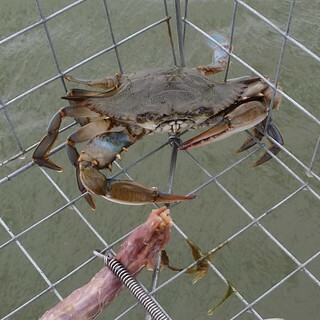 The results of the blue crab winter dredge survey can be viewed at the following link. In the far western part of the state, Deep Creek Lake is providing some wonderful fishing opportunities for walleye this week. Recent surveys by our fisheries biologists revealed large numbers of walleye over 15 inches in length. Fishermen are finding similar results by drifting live minnows or by using a jig/minnow combination. A jig and nightcrawler combo is also an effective rig and the evening hours offer the best fish in areas of the lake such as Beckman’s and Glade coves. Large yellow perch, smallmouth bass and trout can also be part of the mix. Largemouth bass are in their pre-spawn pattern of behavior and as more floating docks are deployed the bass can be found holding near or under these docks. 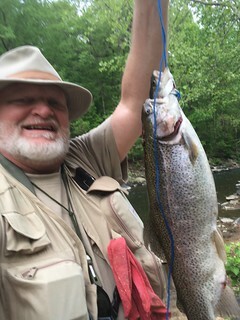 Recent rains have caused the upper Potomac River to be unsafe for fishing at this time and it would seem it will be a while before the waters return to safe fishing conditions. Most trout streams are running at brisk levels but fine for fishing. The trout stocking program continues and some of the stockings in the central region have been large in the put-and-take areas. The special management areas that cater to fly fishing and catch-and-release offer wonderful opportunities this week as numerous hatches of aquatic insects emerged, making for some fun dry fly fishing. Due to unscheduled dam repair work, the Greenbrier Lake water level has been lowered by approximately 4 feet. The swimming area is significantly reduced in-depth, but the beach remains open for wading only. The boat ramp is closed, but kayaks, canoes and other small hand-launched vessels may be launched from the ramp or beach. Camping, picnicking, trails and shoreline fishing remain available. Triadelphia Reservoir also remains closed due to dam repairs there and Stemmer’s Run also is closed as construction work continues there. In most of the regions of the state except the far west, largemouth bass are beginning to shift to a post-spawn mode of behavior depending on water temperatures. The larger female largemouth bass are hungry and will be searching for food in areas near or in the shallower waters. Lipless crankbaits, topwater lures and soft plastics are good choices near grass or any kind of structure. A lot of territory can be covered by using spinnerbaits in transition areas and fishing in grass with plastics is always a good bet. In the tidal rivers, the grass beds and spatterdock fields usually offer the best fishing along the edges during a low ebb tide. Spinnerbaits, crankbaits and jerkbaits are all good choices when fishing these edges. Crappie are beginning to feed more aggressively, as they are now in a post-spawn phase. Using small, curly-tail spinnerbaits is a great way to fish for them, and of course a minnow slip bobber is hard to beat. Channel catfish are very active in just about every tidal river in the state and offer some fun fishing from small boats or shore. The department has put together a comprehensive map showing access points where one can fish or launch small craft. It is worth taking a look at to discover new fishing opportunities. Nearshore water temperatures are about 58 degrees this week and despite rainy weather there are some exciting fishing opportunities developing. Surf casters are enjoying a mix of large bluefish and some respectable, legal-sized striped bass. 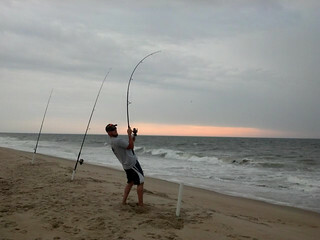 Cut mullet or menhaden on a cork float bottom rig tends to be the most popular way to catch them. The cork helps keep the bait off the bottom and away from clear-nosed skates and to some degree spiny dogfish. Medium-sized black drum are being caught on clam baits and a few kingfish are being caught on bloodworms and small strip baits. Large bluefish have been moving in and out of the inlet, often at night, and can be caught by drifting cut bait or casting bucktails and various lures. Flounder are moving through the inlet and setting up in the back bay areas. They can be caught in the channels near the inlet or on channel edges in the back bays on a falling tide. Large soft plastic Gulp baits tend to work for catching the largest flounder. There continues to be catch-and-release fishing for sub-legal striped bass around the Route 90 Bridge by those using topwater lures or swimbaits. A few boats have been trolling along some of the shoal areas outside the inlet and catching some large bluefish. It will not be too much longer that large striped bass on their northward migration to New England waters should be passing through these areas. The sea bass season opened this week and everyone that could went out Tuesday. Some wrecks, such as the Marine Electric, were covered with sea bass and limits were common, but other boats did not fare as well on other sites. The sea bass season will run until Dec. 31 with a 12.5-inch minimum and a 15 fish/day limit. The tautog season closed Tuesday so the tautog around the inlet and Route 50 Bridge are strictly catch-and-release. The one-day overlap of seasons allowed anglers to catch tautog and sea bass on the same trip, a rare event enjoyed by all. The tautog were caught on green crabs and the sea bass on squid. Tautog season will reopen July 1.